Hillary Clinton’s AIPAC speech was a symphony of craven, delusional pandering. Clinton had an opportunity to show some political courage. She decided to alienate the left instead. Democratic Presidential hopeful former Secretary of State Hillary Clinton speaks at the AIPAC conference in Washington, D.C., March 21, 2016. Any presidential candidate speaking to AIPAC, the American Israel Public Affairs Committee, during an election year is going to bow to the hawkish elements of the Israel lobby. Hillary Clinton’s keynote speech at AIPAC’s annual meeting Monday, however, was more debased than it needed to be, promising that under her administration, Israel will be spared even the mild rebukes it has suffered under President Obama. A symphony of pandering, it attempted to outflank Donald Trump on the right and will end up outraging a large chunk of the left. As Joe Biden acknowledged in his AIPAC speech on Sunday, Israel’s “steady and systematic process of expanding settlements, legalizing outposts, seizing land” is making a two-state solution impossible. The settlements are pushing Israel toward a one-state reality, in which Jews rule over the Arabs with whom they are geographically intermingled. Clinton’s speech, however, barely nodded toward this reality, and when it did, it was with a promise to protect Israel from the consequences of flouting international law. She spent significantly more time railing against the “alarming” Boycott, Divestment and Sanctions Movement, which is gaining traction on college campuses nationwide. Pledging to “take our alliance to the next level,” Clinton said that one of the first things she’d do in office is invite the Israeli prime minister to the White House. That was a barely veiled rebuke to Obama, who never treated Benjamin Netanyahu with the deference the prime minister felt entitled to. Before the speech, some had hoped that Clinton might offer a word of solidarity or encouragement to beleaguered progressives in Israel. She gave them nothing. Anti-Trump neoconservatives, however, are a minuscule group of people. And in seeking their approval, Clinton has further alienated left-wing voters, particularly young ones. Polls show that Americans under 30 are far more critical of Israel than are older voters. Liberal Democrats sympathize more with the Palestinians than they do with Israel. There is already deep suspicion of Clinton’s foreign-policy instincts among Bernie Sanders’ supporters; Clinton doesn’t need to give them new reasons to distrust her. 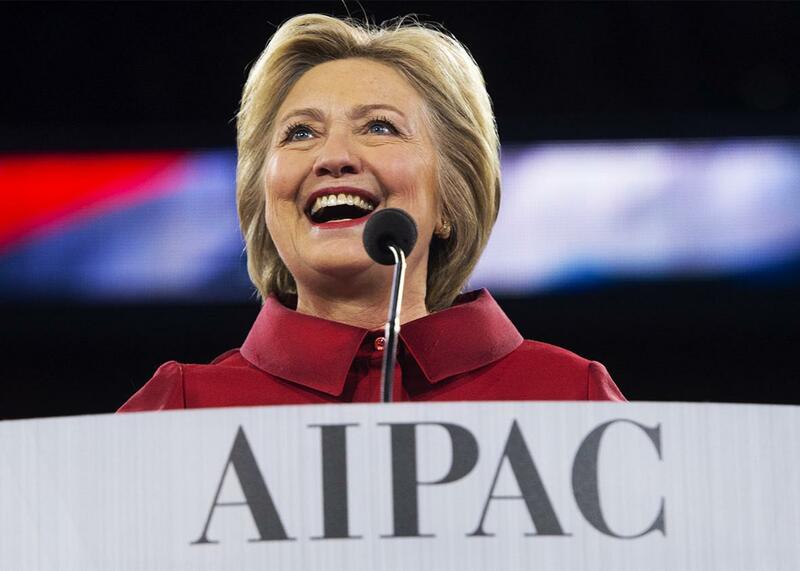 This year of all years, Clinton could have afforded to show a bit of courage before AIPAC. Jews will vote Democratic no matter what. Sixty-nine percent of them voted for Obama in 2012, despite the well-known tension between him and Netanyahu. Unlike Obama, Clinton is going to be running against a demagogue with German roots who plays footsie with white supremacists and reportedly kept a volume of Hitler’s speeches beside his bed. She’ll have all the Jewish support she needs without sucking up to the Likud. So why is she doing it? Her correspondence with adviser Sid Blumenthal—a man loathed by the Israel lobby for not disavowing his anti-Zionist son, Max—suggests that she’s aware of the damage Netanyahu is doing to the cause of peace in the Middle East. But if she is, she doesn’t care about it enough to take even a tiny political risk, to tell a crowd something other than exactly what it wants to hear. Either Clinton’s AIPAC speech was driven by belief, or it was driven by cynicism. It’s hard to say which is worse.